224 p. : ill. ; 21 cm. Greg Heffley is in big trouble. School property has been damaged, and Greg is the prime suspect. But he&apos;s innocent--sort of. The authorities are closing in, but when a blizzard hits, the Heffley family is trapped indoors. Greg knows that when the snow melts he&apos;s going to have to face the music, but could any punishment be worse than being stuck inside with your family for the holidays?. 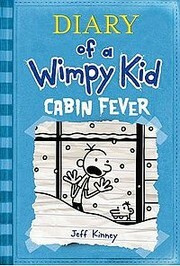 Diary of a wimpy kid :Cabin fever : cabin fever / by Jeff Kinney. Diary of a wimpy kid ; 6. Kinney, Jeff. Diary of a wimpy kid ; 6. 246 VaryingTitle 3 $a Title proper/short title Cabin fever. $v Vol. no./sequential designatn 6. 510 Citation/Refs 3 $a Name of source Junior Library Guild. 520 Summary $a Summary, etc. note Greg Heffley is in big trouble. School property has been damaged, and Greg is the prime suspect. But he&apos;s innocent--sort of. The authorities are closing in, but when a blizzard hits, the Heffley family is trapped indoors. Greg knows that when the snow melts he&apos;s going to have to face the music, but could any punishment be worse than being stuck inside with your family for the holidays?. 521 Target Audience 1 $a Target audience note 10-13. 521 Target Audience 2 $a Target audience note 5-8. 586 Awards Note $a Awards note A Junior Library Guild selection. 650 Subj:Topic 0 $a Topical term Diary fiction. 650 Subj:Topic 0 $a Topical term Humorous stories.